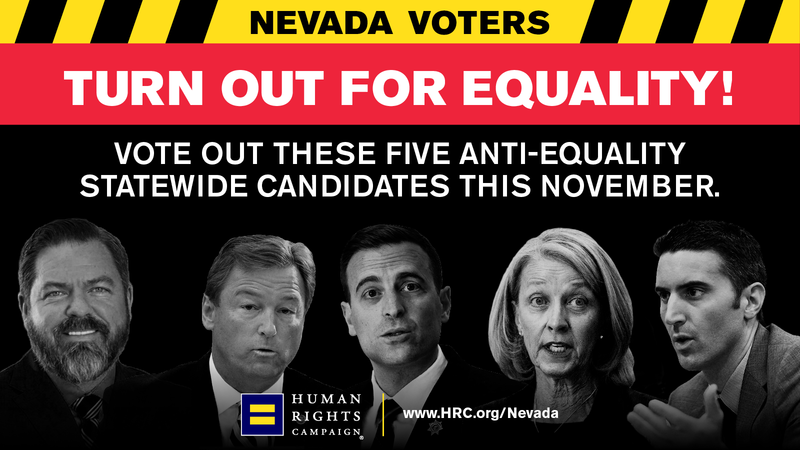 Ahead of November’s midterm elections, HRC is exposing Nevada’s anti-equality candidates and highlighting their abysmal records on LGBTQ issues. From blocking crucial protections for LGBTQ youth, to discrediting brave servicemen and women by supporting discriminatory policies, these candidates are not fit to serve office or represent the open-minded people of the Silver State. These records of discrimination are not reflective of the values of justice and fairness Nevadans hold dear. HRC is committed to channeling power to the polls and mobilizing Nevada’s more than 100,000 LGBTQ voters and more than 500,000 Equality Voters in support of HRC-backed pro-equality champions for statewide office like Jacky Rosen, Kate Marshall, Aaron Ford, Susie Lee, Dina Titus, Steven Horsford and Nelson Araujo, who will fight on behalf of all Nevadans. Learn how you can cast your vote and check your voter registration status, volunteer with HRC and stay updated on HRC’s efforts in Nevada.